How do you say greet people and invite them to the table? I thought "greet people to the table" meant that, but my English teacher told me, I can't and I can only say "greet people at a table", so how do you say greet people and invite them to the table in the shortest and most idiomatic way possible? Chad knew the moment he stepped into El Rosal for dinner that night he was in trouble. He thought he'd come in early -- just after five -- and would beat the Saturday crowd. The place was packed. No tables were free. No bar stool was empty. And there was a thrity minute wait for a table. The early-bird specials were apparently quite popular. Who waved him over to join his table? Stan Musial, who was eating with Bob Gibson, Lou Brock and Jack Buck. It was apparently a very enjoyable lunch. (*) Please notice, JJJJ, that "greet" means "say hi" and "wave" means "raise your arm and move your hand from side to side in order to make someone notice you". 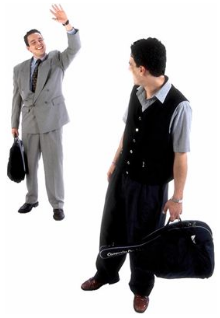 Even if we sometimes greet and make this gesture at the same time (see picture from the Longman dictionary below) and waving can be a form of greeting (see this article: https://www.theguardian.com/society/2018/apr/14/dad-wave-nod-how-greet-hug-kiss-handshake), they are not synonyms. However, as a teacher I understood what you meant. If you want to express exactly that meaning, just use the conjunction: "Greet people and (invite them to sit down)/(show them to their seat)" There will be other expressions you could use. Not the answer you're looking for? Browse other questions tagged phrase-request politeness or ask your own question. How to thank people who correct me on my incorrect pronunciation? What is the shortest form to indicate a multiplication factor / a count / a number of available systems in a table heading? Interpretation and meaning of “”They were speaking to each other halfcircular words at the semiround table." What do you call a legal statement that states a fact rather than stating a rule of conduct or procedure?